From April 1984: an IPC House Ad for the second EAGLE HOLIDAY SPECIAL. One of the joys with getting every new copy of a regular comic was flicking through the pages to see what other stuff you could go out and get. 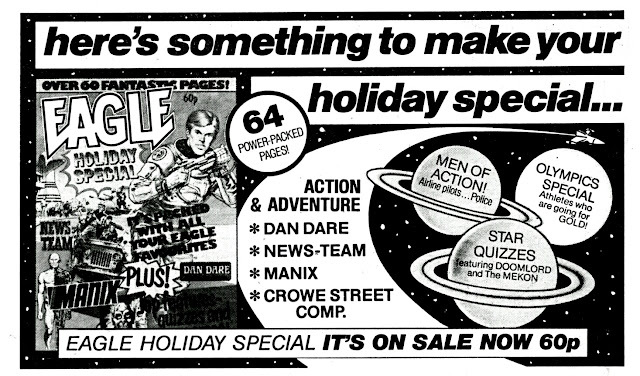 Holiday Specials (restricted to one a year at King's Reach Tower but published 2-4 a year over at the British Bullpen) were always a good excuse to hunt the shelves of various local newsagents until a copy could be tracked down. Or sometimes they'd hit BEFORE the first sightings of the adverts. Always a pleasent surprise... unless you had to dash home to get (beg!) more pocket money and then dash back to the shop... all the time hoping no-one else had spotted and snagged it. How many of you used to tuck must-have purchases behind something less enticing until you could broker a deal to secure the cash?